I have one big baby naming rule: Don’t name your kid the same name as your friend’s kid. It’s not cool. During family gatherings, everyone suggests baby names to Frank and I. Every time I veto a name because my friend has a son or daughter named that, I get the “who cares?” response. I do! I would be so mad if a close friend stole my perfect baby name. Parents think long and hard about what to name their children and while copying can be taken as a compliment, I would still be upset. 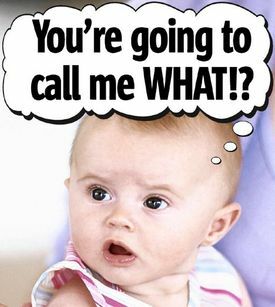 Plus, I want my baby’s name to be unique to my family and friends (though not too far out there)! There was one boy’s name in particular that Frank and I were leaning towards. Then we found out two of my friends who have confirmed pregnancies with boys and who are due before me, will be naming their son this name. In addition, I saw a few new babies on my Facebook feed with this suddenly popular name. It’s now a no-go. How awkward would that be for me to have “insert baby name here” #3? Maybe our baby’s name will end up being popular, maybe it won’t. However, one thing is certain- it won’t be sharing names with any children we know!